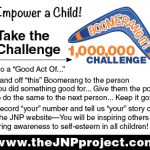 Our goal is to reach 1,000,000 “Acts of ……….” A boomerang act is one of the ten core values supported in each of the Jane & Jake’s Adventures book series. These include: TRUTH, KINDNESS, HARMONY, FORGIVENESS, GIVING, LOVE, DETERMINATION, COMPASSION, STRENGTH, CHARACTER = everything that makes up YOU. 3. 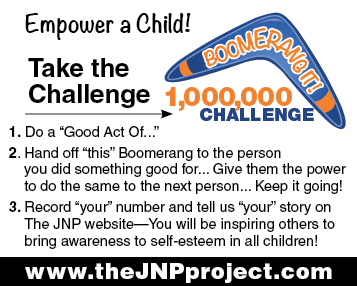 Hand off the boomerang to someone else, and feel really good! 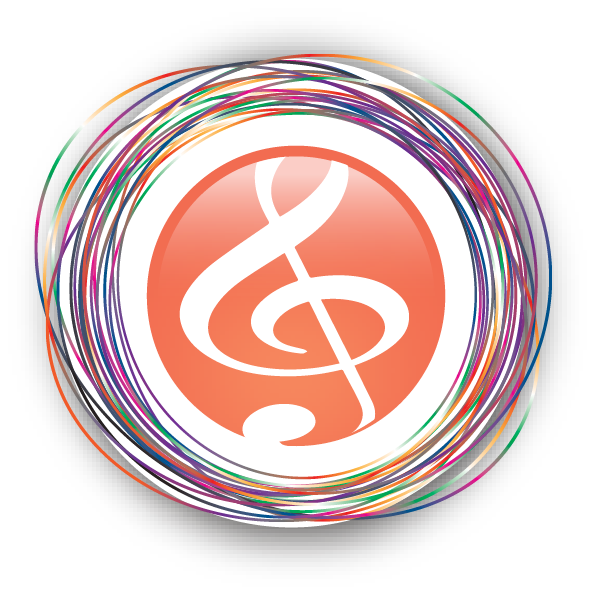 Specifications: 13.75″ in diameter x .375″ thick; lightweight foam. Our goal is to reach 1,000,000 “Acts of ……..” “A boomerang act is one of the ten core values supported in each of the Jane & Jake’s Adventures book series. These include: TRUTH, KINDNESS, HARMONY, FORGIVENESS, GIVING, LOVE, DETERMINATION, COMPASSION, STRENGTH, CHARACTER = everything that makes up YOU! Choose “YOUR ACT OF…..” and make a positive difference by going out and paying it forward! 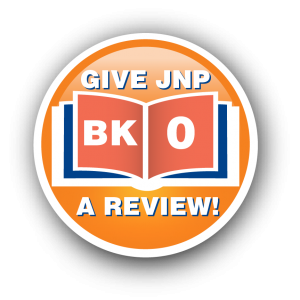 After you send out your boomerang act, share it with the JNP community and watch what happens! TRACK YOUR BOOMERANG IT! 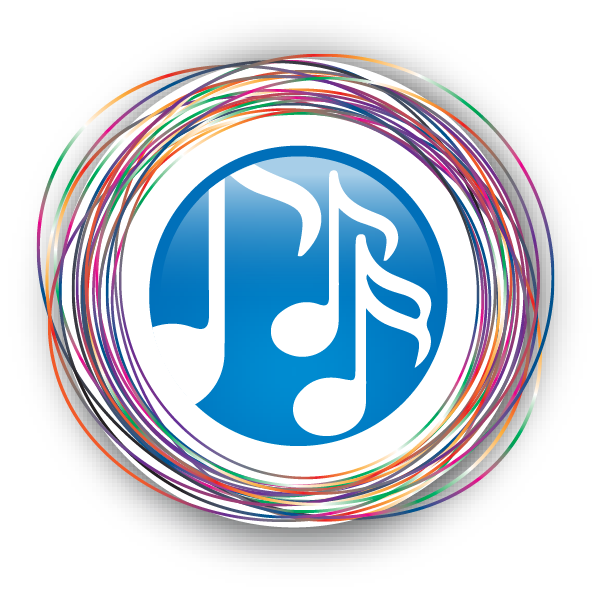 ACT — Click here. 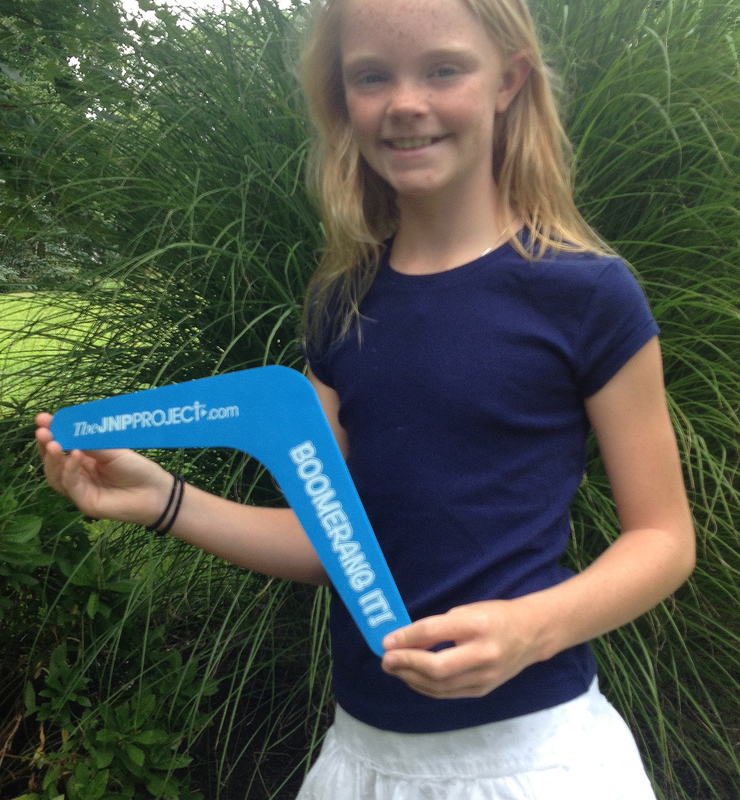 SEND IN YOUR BOOMERANG IT! ACT — Click here.